Just over a month to the British Columbia’s 2018 Paleontological Symposium and we’re so excited to be hosting it with the Vancouver Island Paleontological Society. 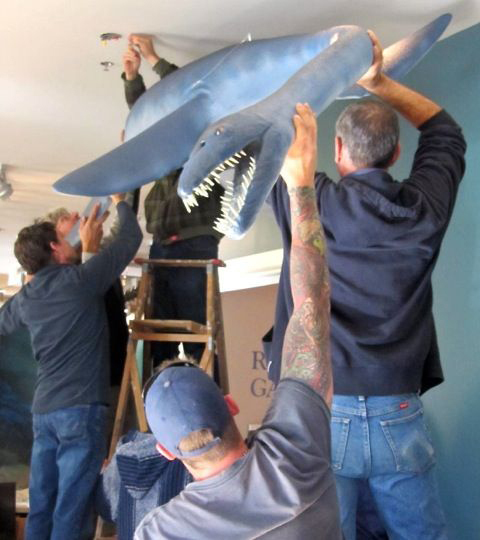 The team of workers hang the fleshed-out juvenile elasmosaur at the museum. Almost a quarter-century has passed since Mike Trask and his daughter Heather discovered the fossilized remains of an 80-million-year-old elasmosaur on the banks of the Puntledge River near Courtenay. But at last he has come face-to-face with what the fearsome creature would have looked like when it was alive. 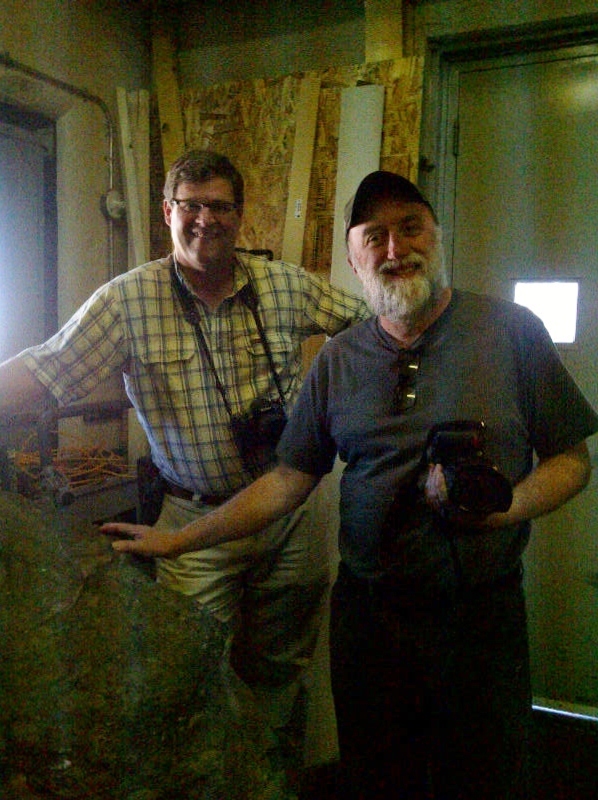 Trask was at Courtenay and District Museum to witness the arrival of its latest exhibit – a scientifically-accurate fleshed out version of the species from the Age of the Dinosaurs—a juvenile elasmosaur. For years, a star exhibit at the museum has been a cast of the skeleton of a 40ft-long adult elasmosaur, suspended over displays highlighting the fascinating fossil and natural history of the Comox Valley. The original fossilized bones found by Trask and his daughter are also on exhibit. Now as part of a major upgrading of the museum’s displays, the recreated cast and real bones have been joined by a young elasmosaur. It was created especially for the museum by Palcoprep Inc – a company based in Drumheller, Alberta, with an international reputation for accurately casting, moulding and reconstructing creatures ancient and modern. Company President, Frank Hadfield, was on hand to see the juvenile elasmosaur hung in place at the museum – with its open mouth full of sharp teeth lunging down towards visitors as they step into exhibition areas. The model was created by Palcoprep, Artist Jim Wood, and the museum’s Executive Director, Deborah Griffiths, is thrilled with the result. “I’m sure the kids will love it,” she said, “On Nov. 17th we’ll be displaying this new addition to the exhibits at the elasmosaur’s annual birthday party. It gives us some idea of what a juvenile elasmosaur could have looked like”. Mike Trask was equally impressed. “It’s hard to put into words after all these years, but until now, people have had to imagine what an elasmosaur would have looked like in the flesh. It’s great to see this young version of what we found added to the exhibits here – it really helps bring the story to life”. It was in 1988 that Trask and his then 12-year-old daughter were prospecting for fossils along the banks of the Puntledge when the elasmosaur remains were found. After months of investigation involving scientists at the Royal Tyrrell Museum in Alberta, and the Royal BC Museum, the discovery proved to be the first elasmosaur recorded in British Columbia—the first of its kind west of the Canadian Rockies. Within months of the marine reptile’s discovery, the Courtenay Museum, working with the province, secured the elasmosaur location as a legislated provincial heritage site; set about to excavate the rest of the creature using staff and many volunteers. The excavation was led by Dr. Rolf Ludvigsen and the late Dr. Betsy Nicholls of the Royal Tyrrell Museum. 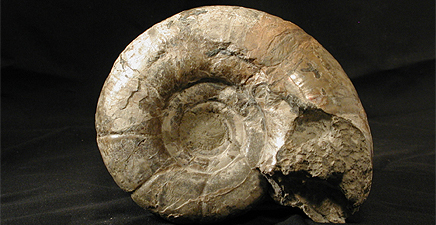 Since then, there have been many other fossil discoveries in and around the Comox Valley, and the museum’s collection of prehistoric remains now numbers around 6,000 items. The new exhibit is part of an upgrade to the museum’s exhibits, sponsored by Community Futures Strathcona and the Rural Economic Development Initiative of B.C. and the museum; all of which see the project as boosting local tourism, business and jobs; as well as opening up a treasure trove of exhibits to a much wider audience. From 11am to 4pm on Saturday, November 17, the museum is inviting the community to drop by and join in the Elasmosaur birthday celebrations.